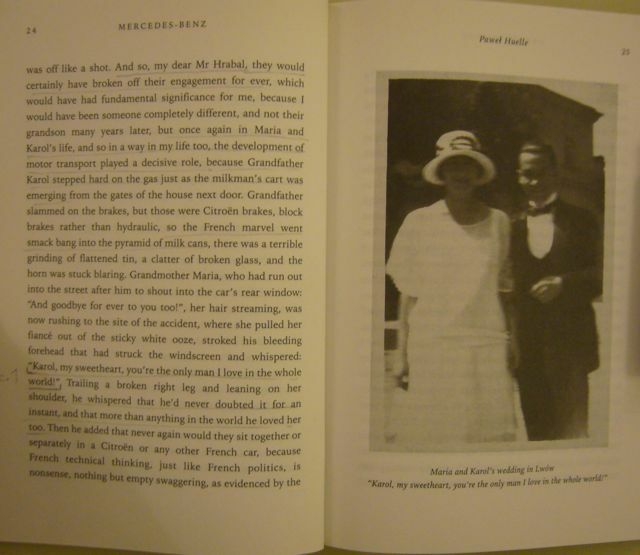 I’ve just finished reading your short but dense novel Mercedes-Benz – in the English translation by Antonia Lloyd-Jones, of course, since I don’t know a word of Polish. Indeed, yours is one of the very few Polish novels I’ve ever read. And I’m grateful to Serpent’s Tail, your British publisher, for doing what they do, which is bringing foreign-language books to our attention, since there aren’t really enough of them on the market. 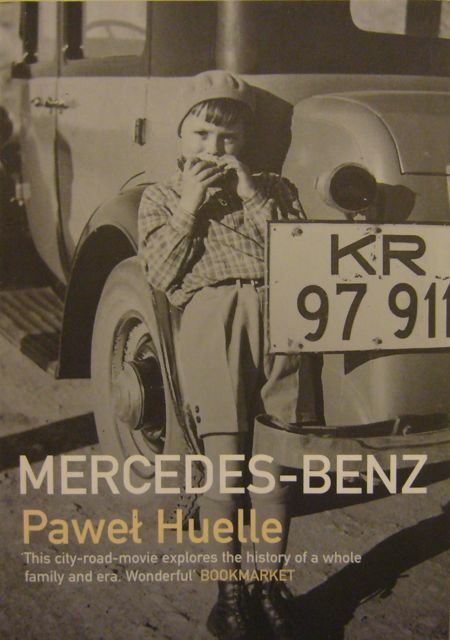 Cover of Pawel Huelle's Mercedes-Benz (London: Serpent's Tail, 2005). 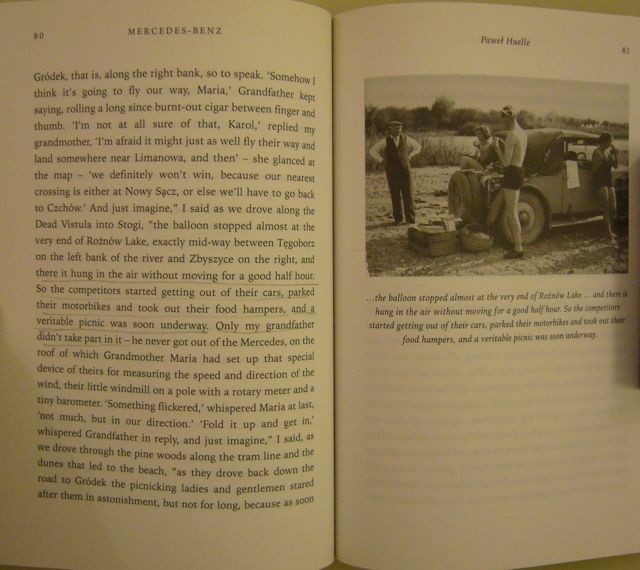 If I understand correctly, Mercedes-Benz is part of a series of Letters to Hrabal, and indeed, I often thought while reading it that it is in fact a love letter of sorts to Hrabal, whose storytelling powers your narrator, “Mister H.”, is so fond of and whose death in early 1997 leads him to dig up his family photographs and start writing. Mister H. is a storyteller himself, of course, spinning his yarns for his driving instructor, Miss Ciwle, a Hrabal fan herself, as they make their way through the Gdansk of the early nineties in her Fiat 500. I liked the way you manage to give us a glimpse of Polish history as they drive through the city. The names of the streets and landmarks alone give us a good idea of the country’s tumultuous past: from Napoleonic forts to Warsaw Insurgents Street, from Prussian barracks to the Soviet T-34 tank being removed from Crab Market. I also liked the way you evoke your country’s history through the tales Mister H. tells Miss Ciwle about the family’s history of cars, from grandmother Maria’s Citroën in the twenties to the series of Mercedes that followed – a history that came to an end in the early seventies, when an official from the Department of Aesthetics tells Mister H.’s father to get rid of his old and rotting Mercedes since “the sight of it was having a bad effect on local well-being”. From the book under discussion. But if truth be told, I found the humour rather weak. It’s too often filmic, almost cartoonish: stalling in heavy traffic and on a railway crossing, getting tangled in the seat belt, hitting the accelerator instead of the brake and crashing into a bin, etc. I guess it’s just intended as light-hearted comedy, but wouldn’t you agree that we’ve all seen these scenes a thousand times before and that the comedy itself sometimes stalls? Of course, Mister H. is a melancholy type of fellow who believes he was born too late, and perhaps he would have loved to find himself in a black-and-white comedy. He has little love for the present, in any case, which he sees, perhaps rightly so, as some kind of corrupt capitalist inferno (and you certainly seem to voice your dislike of contemporary art in that strange digression on Physic’s adventures on the Californian art scene: I mean, where does that fit in?). If Mister H. isn’t at home in the present, maybe that’s why he’s so attached to his collection of family photographs, and feels “truly disinherited” when he believes he’s lost them. But he finds them in the end, and it’s only after he’s dug up these pictures that he starts writing, and it’s these pictures you include in the novel. I don’t know whether they add all that much to your work, and I’m not sure they work well with the at times erratic tone of the text, as it moves from light comedy to angry rant to more somber melancholy. Still, I found the four featuring members of your family to be the best: not moving, but tender. Of course, though he didn’t lose the photographs, Mister H. does lose Miss Ciwle – and if you ask me, it serves him right. I mean, if he was so fond of her, why didn’t he sleep with her? All this talk about them being “fraternal souls” because they both like Hrabal and like to smoke pot in silence. What? Should that prevent them from sleeping together? Whether he does so intentionally or not, he certainly seduces her with his stories, but fails to seduce her in the flesh. Why is that? I think he doesn’t really love her, but ultimately seems to pity her. The more I learned about her – her past as a stripper who had to sleep with the head of the driving school to get a job and a car, her handicapped brother she has to take care of, the mean and corrupt doctor who treats her brother, the shed she and her brother live in next to a cemetery, and, the last straw, the fact that the shed has been levelled to make way for a building project at the end of the novel – the more I thought that the only narrative response to this was not to lapse into silence as Mister H. does repeatedly, but to laugh. Surely the accumulation of so much ill fortune on a single character is funny in itself, no? Anyway, this is where I get off, so thanks for the ride, and bonne route. This entry was posted in Pawel Huelle, Picture novels and tagged fiction, Mercedes-Benz, Pawel Huelle, photography, picture novels. Bookmark the permalink.